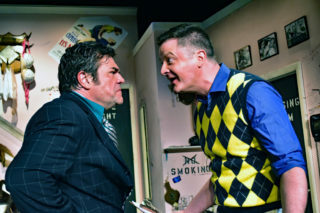 For over two decades, Providence Players of Fairfax has built one of the region’s best community theaters: an award-winning, community-supported, membership theater company committed to providing quality, affordable theater to the residents of Fairfax and the greater Northern Virginia and Washington D.C. area. We are extremely proud of what we have accomplished. We have a growing audience and stable financial base. This is largely due to the support of our donors, members, volunteers and patrons. If you are one, we thank you! So, if this is your first visit to our site or you are a frequent visitor, we hope that it provides you the information you need to make your visit to one or many of our performances an enjoyable one. Thanks again for visiting and we look forward to seeing you at the theater! To provide an entertaining and affordable quality theater experience in the greater Fairfax community while providing an opportunity for Fairfax area residents to participate in all aspects of theater production. Commitment to artistic excellence – strive for excellence and stretch itself artistically in all of its theatrical productions. Commitment to participation and learning – creative expression and personal fulfillment through opportunities to learn about theater, to teach, to perform and to support the productions. Commitment to our member community – development of a cohesive community of member artists by supporting our current members and their families, and by reaching out to welcome newcomers to the troupe that best represent the diverse community we serve. Commitment to the broader community – using our talents in the theater arts to make the James Lee, Fairfax community, the northern Virginia and Washington area communities a better place to live. On average, each production is supported by at least 60 volunteers: producer, director, actors, set/light/costume designers, set construction, production crew, and house management volunteers. Volunteer with us! Providence Players is committed to its community and primarily supports the Northern Virginia area with a particular focus on Fairfax, Falls Church, Annandale, Vienna, Arlington and Alexandria.